The setting for this tearful portrait was in our own backyard, for the good reverend, like 1,490 other Issei, was arrested and detained at Tuna Canyon Detention Station, located in the Verdugo Mountains less than 10 miles away from the San Fernando Valley Japanese American Community Center. If you have ever enjoyed a round of golf at the Verdugo Hills Golf Course, you were standing on the same site that housed several thousand “enemy aliens” of Japanese, and to a lesser extent Italian and German, heritage. Like Rev. 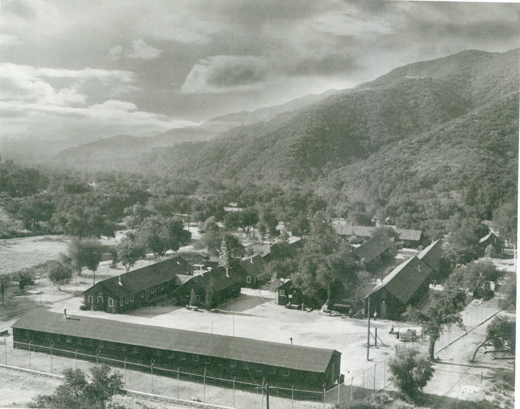 Tana, the other Issei interrogated at Tuna Canyon were pastors, judo teachers, or farmers association officers: men we would laud as community leaders today but who were cast under a shadow of suspicion owing to intense anti-Japanese hatred that had existed even before the bombing of Pu’uloa (Pearl Harbor). Today, there is nothing to mark the presence of Tuna Canyon and the golf course is scheduled for residential development. A committed group of activists, including SFVJACC President Nancy Oda and former SFV JACL President Nancy Takayama, are working with City Councilman Richard Alarcon’s office to do something about this sad erasure of important local Japanese history. We are urging the City Council to give the site “historic-cultural monument designation” to acknowledge its historical significance. Unfortunately, the Cultural Heritage Commission voted unanimously to deny this request. Nevertheless, we are mobilizing support for the designation in preparation for a vote by the City Planning and Land Use Management (PLUM) Committee and the City Council. This is an important piece of our collective history. The deep-seated prejudice and racism that shunted innocent immigrants into places like Tuna Canyon largely based on their race must not be forgotten. Having a historic designation will allow us to pursue actions such as placing a commemorative plaque and tap into grants to fund wider educational initiatives. How can you support? If you would like to get email updates, contact Gerald Gubatan ([email protected]) of Councilman Alarcon’s office. You can also attend the PLUM meeting on Tuesday, June 11, at 2:30 p.m. and the City Council vote, which will likely be a week later on June 18. It’s important to have an impressive presence to show there’s a groundswell of support for Tuna Canyon. During the public hearing portions, you can share your thoughts on why this is an important cause, or simply appear to show you care. If you’d like to write letters of support to the council (we’ll need 10 “yes” votes out of 14), contact me at [email protected] or ask Nancy Oda ([email protected]) for contact information. DeGuzman is a Ph.D. student at the UCLA Department of History. Thank you very much, Rafu Shimpo, for running this article! Please note, though, that the dates have changed for the hearings. The PLUM Committee will take it up on Tuesday, June 11, 2013, at 2:30 p.m. at City Hall. The City Council vote will likely be a week later on the 18th. I will revise the article. Wachs supports the development because of restrictive conditions he worked out with the developer, MPH Development Co. of Granada Hills. The conditions require donation of 33 hillside acres to the Santa Monica Mountains Conservancy, building houses on 20,000-square-foot lots and preventing grading of steep hillsides. I want to make it clear that those of us who are pushing for historical designation are focused on this task and education about TCDS. In our view, development is a completely separate issue and our attention and energy is on getting the City Council to grant historical/cultural status. The comment by Barbara Pitts is inappropriate. Her note is actually a direct quote from a November 11, 1988 Los Angeles Times story that obviously involves some past controversy. It should be completely disregarded. Jean-Paul DeGuzman has written a fine letter. As the grandson of a Tuna Canyon detainee, I urge others to follow his advice and become actively involved in this issue.